A seafood restaurant in Maine claims to have a more compassionate method when serving up its lobsters: get them stoned first. Charlotte's Legendary Lobsters Pound now offers patrons the option of having their tasty crustaceans "sedated" with weed before being steamed to death. According to owner Charlotte Gill, Roscoe was the first shellfish she got high by placing it in an enclosed box and blowing cannabis smoke into the water like a reverse bong. Gill claimed that the lobster appeared more tranquil and even had a calming effect on its soon-to-be-eaten friends when she placed it back into a tank. "If we're going to take a life we have a responsibility to do it as humanely as possible," said owner Charlotte Gill to the local Mount Desert Islander. The story was widely picked up to the delight of headline writers and art departments at major new outlets. The pot used to get the lobsters lifted is grown by Gill, who is a licensed medical marijuana caregiver, allowing her to possess up to 70g and 6 mature plants. However, the restaurateur emphasises that her stoned-out lobsters won't get humans high since any THC residue is eviscerated by the temperature it's cooked at. But how effective is her technique of smoking out the lobster before steaming them alive? Though some crustaceans may have cannabinoid receptors, according to a UK study, there are many unanswered questions. Do lobsters' receptors work the same way as humans' and would pot have a similar effect on these animals? If they do, would weed even do anything for pain? Do lobsters feel pain in the first place? In this Saturday edition of Giz Asks, we reached out to top experts in invertebrate zoology and marine biology (and PETA) to try to answer some of these questions, and to determine whether this eatery is lessening the lobster's pain or just wasting perfectly good weed. Even if lobsters did have CB1-type and CB2-type proteins, it wouldn't necessarily suggest that marijuana could cause pain relief in lobsters, because the nervous systems of lobsters and mammals are very different. It is possible that marijuana contains chemicals that cause pain relief in lobsters but this would have to be proven experimentally. I'm sure no scientist has asked that question. 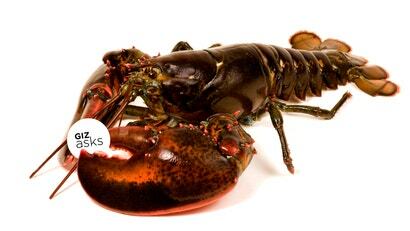 My answer is it is likely that lobsters have receptors that could respond to active ingredients. No one has shown to my knowledge that lobsters feel pain. I would be surprised if they didn't. There is also no info on what the pathways do in lobsters. My gut says this probably doesn't work. Or perhaps, a better way to say this is there is no evidence it would work and some evidence to suggest it doesn't. Insects (which are related to crustaceans) lack the neural receptors in the brain that produce the effect of cannabinoids in vertebrates. I'd have to do a little more digging to see if crustaceans (lobster) do have them (unlikely if insects don't, but possible) or that other receptors could perform this function (almost certainly unknown). That description is insufficient to simply accept the claim: no reason is given to think that the active ingredient is actually taken up into the lobster's gills, let alone have an effect on the lobster's nervous system. It is highly unlikely that getting a lobster high would make a lick of difference when it comes to the full-blown agony of being boiled or steamed alive. There is a well-established, foolproof way to prevent crustaceans from suffering, though, and that's by not eating them. PETA offers recipes for vegan lobster "taste-alikes" — even one made from soy — and urges people to eat for life, the animals' and their own, given that lobster is high in cholesterol.